UA Presents is bringing the choral work to Centennial Hall on Tuesday, April 16. Its composer, Craig Hella Johnson, says he has been gratified by “a huge open-hearted, deep response” from audiences. 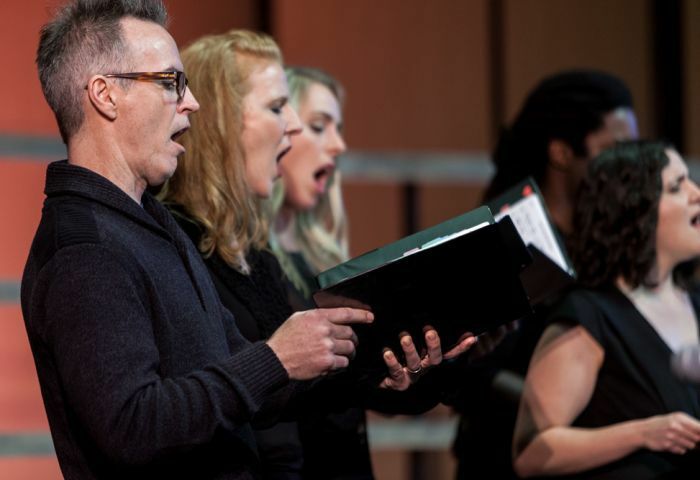 The Austin, Texas-based Conspirare choir is touring with “Considering Matthew Shepard,” a poignant musical response to the hate-crime murder of a gay Wyoming university student in 1998. Conspirare brings its national tour of the moving oratorio “Considering Matthew Shepard” to UA Presents. In the days after gay Wyoming college student Matthew Shepard was beaten and left to die in a remote field near Laramie in October 1998, Craig Hella Johnson thought about how he and the world should respond. It took Johnson nearly 20 years to come up with that response, a 100-minute contemporary oratorio “Considering Matthew Shepard” that he and his Austin-based Grammy-winning choir Conspirare are bringing to Centennial Hall on Tuesday, April 16. “There are many hate crimes that happen, sadly, to this day. But there was something about this particular story that found a way to draw international attention and highlight all of these issues,” Johnson said. That takes us to that night on Oct. 6, 1998, that culminated in Shepard’s brutal death and the aftermath, when religious fanatics from the Westboro Baptist Church shouted at mourners, including Shepard’s parents, as they entered the funeral. But “Considering Matthew Shepard” also has a ray of hope, a sense that we can move beyond our hate and embrace our differences. “It’s a strange thing because Matt’s story is a very sad and tragic story, but the invitation is one to contemplate something different,” said Johnson, who will conduct the 31-person mixed choir and eight instrumentalists on Tuesday night. Conspirare, which Johnson formed in 1991 and began regularly performing with in 1999, has taken “Considering Matthew Shepard” to 23 cities since the choir started touring the piece nearly two years ago. The work, which was nominated for a Grammy in 2017, was recently published and is now being performed around the world. “There has been a huge response, a huge open-hearted, deep response from people. It’s been very moving,” said Johnson, 56. Every once in a while as the music moves from gentle wind blowing to the heart-pounding scenes of the young man being beaten, Johnson will hear quiet sobs coming from the audience. Conspirare performed the work in Washington, D.C., last October — two weeks after the 20th anniversary of Shepard’s murder — when his remains were interred in the National Cathedral. What: Conspirare "Considering Matthew Shepard"
This will be the fourth location for the popular neighborhood restaurant/bar.